An airtist's impression o a Pioneer spacecraft on its wey tae interstellar space. 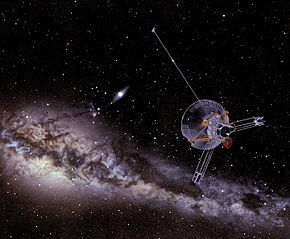 Pioneer 11 (an aa kent as Pioneer G) is a 259-kilogram (571 lb) robotic space probe launched bi NASA on Apryle 6, 1973 tae study the asteroid belt, the environment aroond Jupiter an Saturn, solar wind an cosmic rays. ↑ Fimmel, R. O.; Swindell, W.; Burgess, E. Pioneer Odyssey. SP-349/396. Washington, D.C.: NASA-Ames Research Center. OCLC 3211441. Retrieved 9 January 2011. This page wis last eeditit on 15 October 2017, at 01:27.